Documentary filmmaker Niobe Thompson recently released The Perfect Runner, an anthropological exploration into the evolution of running. Making the film took Thompson from the highlands of Ethiopia, to remote Arctic Siberia, where he interviewed people for whom running is still very much linked to survival. 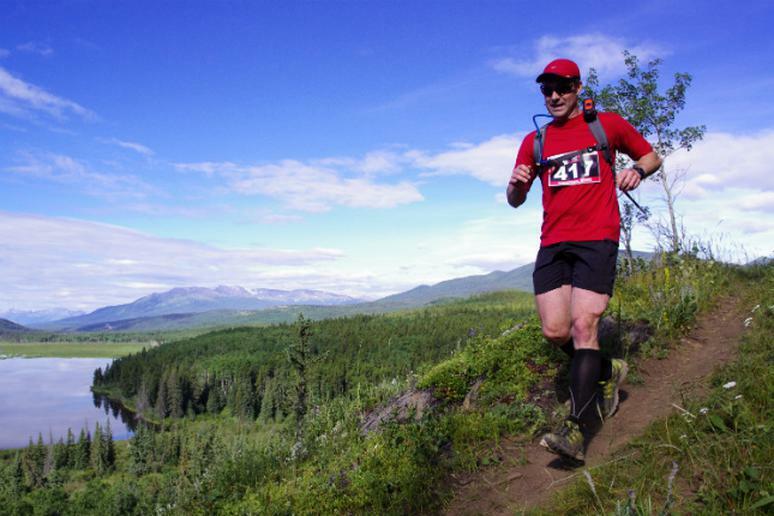 He also takes on world’s toughest ultramarathon— The Death Race in the Canadian Rockies—as a human guinea pig. The Perfect Runner includes interviews with scientists, professional endurance athletes and Siberian herders in a quest to explore humans' evolutionary history as runners. The takeaway is a unique perspective on the science and sport of barefoot running, and on human evolution at large. What inspired you to undertake a running documentary? My journey to the documentary began with my own crisis as a runner, when I developed pattelarfemoral pain syndrome (runner's knee) at about the same time as my two daughters were born. Between the challenges of starting a family, managing a documentary production company, and dealing with the pain, my running really began to suffer. After two decades as a runner, it was gutting to think that my running days were behind me; naturally, I was desperately looking for a way out. That's when I stumbled across the research by Daniel Lieberman and Dennis Bramble on distance running and human evolution, and later their study of running gait and injury, and the lights when on. People often ask me if The Perfect Runner is a film version of Chris McDougal's Born to Run, but in fact the only thing Chris and I share in common is our interest in Leiberman's research. I'm an anthropologist, and I was aware of the 2004 Nature article (incidentally called "Born to Run") when it was published. It was very important for us to explore our past as proto-human running apes with Lieberman, because in the documentary, we set out to tell the story of our evolution as hunter gatherers adapted for distance running as a keyhole into our modern obsession with running. The Perfect Runner aired in Canada on CBC television in March—are there any plans to release the film to the U.S. television audience? We're hoping to have a US broadcaster by the second half of 2012, but in the meantime, national broadcasters in France and Germany (ARTE), Denmark (DR), Japan (NHK) and Australia (ABC) are all planning broadcasts of an extended version of The Perfect Runner. If readers in the US can't wait, they can buy the DVD. How long have you been a runner, and what's the back of your baseball card look like, so to speak? That is: how many years have you been running, how serious are you about it, what races or events have you participated in, etc. I've never been a competitive runner, but distance running has been a big part of my life for decades. I spent seven summers working with a helicopter-rappel forest fire fighting program in Canada, and I had to maintain a high level of fitness throughout those years. After that, running remained a habit I took everywhere I went, working in India and Africa, studying in Russia and the UK, and now back in Western Canada. I've always tended to run two or three half-marathons a year, to give myself ongoing benchmarks and a training structure, but it wasn't until I embarked on the making of The Perfect Runner that I decided to run ultras. The 2010 Canadian Death Race was my first event, and I'm training for the same race this year. Like most runners, I've always implicitly known that I run because I have to, that our organism is simply geared to the motion of distance running. But having spent a year making this documentary, I have a much deeper understanding of the human condition as a runner. It was truly remarkable to learn how many features of our skeletomuscular architecture exist for no other reason than to make us efficient and powerful distance runners. We are metabolically, mechanically and intellectually predisposed to be runners, and our ancestors won the battles of natural selection because they were the best runners in their environment over millions of years. Knowing this, I don't feel I need to strain to explain why I run - running is just what we do, just as birds fly and fish swim. How has the completion of your documentary changed your running—mechanically, or otherwise? I was a classic heel striker for two decades, and I've made a complete switch to forefoot striking in my stride. It seems obvious now, but for years, there was very little information for non-professional runners suggesting that heel striking could be a problem, and the technique was massively encouraged by the running shoe industry and the retailers. But I also learned how to train for ultra marathons in the course of making The Perfect Runner. An 83-miler like the Canadian Death Race demands a comprehensive training approach, embracing everything from descent/ascent technique training, serious foot, ankle and core stability training, "trials-of-miles" running combined with speed work, nutrition, race logistics, and preparing the mind. All of this has made me much more mindful of my abilities as a runner and the ways in which I can squeeze more strength and endurance out of the body I have. In making your film did you, in fact, find the perfect runner? We also worked with the great Haile Gebrselassie in Ethiopia making this documentary, and with 27 world records over his career, you'd be hard-pressed to find a greater runner in modern sport. One thing that few people know is that while Haile has always claimed he was born in 1973, there is pretty good evidence he was born in the late 1960s, meaning he is now in his early 40s. When you can turn in a marathon time of under 2:15 at 43, you are very special. We found some astonishing athletes in Ethiopia, but the nomadic reindeer herders in northern Siberia were extraordinary for the way that a very impressive level of athleticism was simply a part of everyday life. For them, running long distances and working hard from morning until night every day of the week is a way of life they never question, and living with them brought me closer to understanding how humans were evolved over time as running animals - of our true nature - than all the time I spent in museums and laboratories. It's your position that human beings are, at a species level, the perfect runner, correct? And if that's true how do you explain the seemingly high injury rates among avid runners? Are shoe companies or is our sedentary society to blame? As an anthropologist, I find the research of Daniel Lieberman on running shoes, gait and injury both convincing and worrisome. Lieberman has found that most people running in highly cushioned running shoes over-reach in their gait and land on their heels, and that this generates a much higher impact force on the body than landing in minimal shoes or bare feet on the forefoot. I saw the proof myself, when Dr. Lieberman analyzed my own running in his laboratory at Harvard. The conclusion must be that running shoes have enabled a great many runners to land in ways that are biomechanically inefficient, and inefficiency leads to injury. By taking this lesson to heart, I healed my own quite advanced running injuries. Just as serious a contributor to injury is the way we fit running into our modern, mainly urban, lives. The "weekend warrior" approach to sport, whereby most of our time is spent in sedentary pursuits, and in positions that build weaknesses and inflexibility, punctuated by intense exercise, is a recipe for injury. I went to Ethiopia to learn about the incredible success of the country's competitive runners, but what I also learned was that there, runners come from rural, relatively poor backgrounds—childhoods that necessitated constant and diverse exercise, otherwise known as “farm work.” By using their bodies, staying out of cushioned shoes, and working hard, they built balanced bodies prepared to endure the stresses of high-level running. This lesson relates to the training I learned to do for ultra marathons. I soon discovered that simply running, and ignoring core strength work, flexibility and targeted exercises to build foot strength and mobility, will not get a runner to the start line without injury. At the personal, individual specimen level, with so much apparent variation between individuals' gait, form, and biomechanical particularities—do we all in fact have the potential to be some shade of perfect runner? There is no denying the fact that some people are blessed with a runner's body, and other aren't. I fall into the latter group, and if you watch The Perfect Runner, you'll see that I'm what they call a Clydesdale. But even I can run a 1:30 half-marathon and stay on the trail for 12 hours at a stretch in the ultra-marathons. It's a matter of knowing your body and taking care of it. I need to be very careful about core and foot stability to protect my knees, and I also try to keep my weight as low as I possibly can. I'm not the perfect runner in the particular, but I know that I'm carrying around a great deal of evolutionary technology that is inside me simply to help me run. Relative to other primates, I'm an extraordinary runner! As long as you aren't suffering from serious joint or cardiovascular problems, you have the potential to be a runner of some kind. There are so many true stories of people who shed a lot of weight and left behind a sedentary way of life to become regular runners. The objective is not to become a perfect runner, it is to rediscover our nature as a running species. There is a tremendous joy to be found in that discovery.